Esta transmisión EN DIRECTO acaba de terminar ahora, pero otra transmisión empezará en unos minutos. Couch and the Rube: What's your favorite late night sports memory? Business Rap is dedicated to creating content that inspires the ideas that propel the business community forward. Bringing together top business owners, leaders, communication experts, journalists and academics to have thoughtful, important and in-depth roundtable discussions on a wide range of business topics that both educate and ... Más informaciones entertain. Michigan's BIG Show starring Michael Patrick Shiels is your direct connection to the state capitol. Shiels’ personality-based, news making show covers state, national and international politics in a non-partisan manner. MPS skillfully mixes politics, which he affectionately refers to "as the family business" with news, ... Más informaciones business, sports and lifestyle topics you're interested in, keeping listeners informed as well as entertained. His inquisitive personality leads to asking newsmakers relevant questions - pointed, but with respect - and recognizes that listening is the most important quality of a good interviewer. “Everyone is an expert at or on something,” explains Michael Patrick, who uses humor and surprises to draw out quality answers and important information. 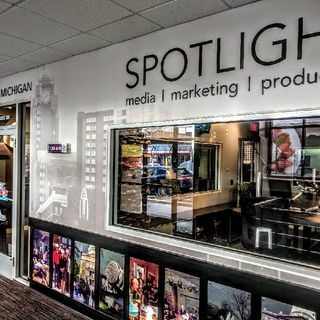 “Every person has a story, and my job is to get guests to the point, while allowing them to express themselves in a genuine manner, in authentic conversation.” Michigan’s BIG Show can be heard every weekday morning on the Spotlight Radio Network and on partner affiliate radio stations across the state. The Drive with Jack and Tom is your afternoon sports companion in Michigan and beyond. It’s an info-taining blend of behind-the- scenes insight, breaking news, blistering opinion and intelligent banter. It’s “We Are There!” broadcast journalism. We’re the eyes and ears of our listeners. We talk the stories that other hosts merely read. ... Más informaciones The Drive can be heard on JackandTom.com and the Spotlight Radio Network every weekday from 3-6 p.m. Eastern (Noon-3 Pacific).